The inauguration as poet Laureate went off well, despite the fact that it was NZ Poetry Day and there were readings and book launches going on simultaneously elsewhere in town. A distinguished group of friends, fellow writers, and family, a warm and sociable Minister (Maggie Barry), and a venue (the Auckland Branch of the National Library) nicely prepared by the staff – my thanks to them all. There was one thing I had intended to say in my speech and forgot, so I will say it here. Some years ago I chaired a session at the Wellington Writers’ Festival, an hour with the distinguished German poet Hans Magnus Enzensburger. Enzensburger was reflecting on the strangeness of the phenomenon of poetry, and said it was the only industry he could think of where the producers exceeded the consumers in number. What I meant to add to this remark was that this fact is a source of poetry’s strength: it can’t be commercialized, or corporatized. It’s one of the few areas of life in New Zealand at the moment not in danger of international ‘investment’. There’s no money in it, and it can’t go bust – which is one of the reasons it survives. So many are doing it, and will go on doing it, privately, even secretly, sometimes hopefully, often with no hope at all that anyone will be interested in what they write, or ever publish it. It’s a reflection of our fascination with language, human kind’s primary tool, and what distinguishes us on our planet. It’s why poetry flourishes during economic depressions, finds work for itself in times of war, goes underground and gains power there under political repression. There is something necessary about poetry, something mysterious, a force. It’s a minority art practiced by so many, even more written than read, but a constant. Another visitor to the Department was the Canadian-born, American-by-adoption, critic Hugh Kenner, already a notable Eliot scholar. I don’t now remember much of his lecture but I remember his natty bow tie and mop of curly hair, and how his at first disconcerting speech (a consequence of deafness in childhood) contrasted with Lionel Knights’s smoothness and fluency introducing him; and yet how the keen intelligence and originality shone through. This was the man who made me aware I needed to know more about Ezra Pound, and who gave the idea of ‘Modernism’ an intellectual edge – made a puzzle and a challenge of it. One purpose of Kenner’s Bristol visit was to cement his association with Charles Tomlinson, a junior lecturer in the Department, and the only British poet whose work Kenner felt was in tune with important things that were going on in American poetry. I can’t now quite disengage my present overview of Kenner from the much less I would have known about him then. He is author of one of the great books of twentieth century literary criticism, The Pound Era (1972) – great not only for its intelligence and scholarship but for liveliness, originality and readability. Yet Kenner can also seem at times a critic with quite extreme quirks and crankiness, prone to clever but absurd overstatement, like a brilliant drunk in full flight. But in that year he was giving Charles Tomlinson a start he might never otherwise have had, putting him in direct touch with American poets he admired, William Carlos Williams and Marianne Moore, and persuading his own American publisher, McDowell Obolensky, to take Tomlinson’s collection of poems, Seeing is believing, which no publisher in England (Charles said he’d tried them all) would touch. This was the time when the British poets of the Movement, in reaction against the flamboyance of Dylan Thomas, George Barker and the ‘new Romantics’ of the 1940s, were being defined and displayed in anthologies, from which Tomlinson had been excluded. Hell hath no fury like a poet shut out of a currently fashionable anthology, and Tomlinson was busy scourging the Movement in journals on either side of the Atlantic – in Poetry (Chicago), and in Essays in Criticism (Oxford) where he devoted no fewer than nine pages to the punishment of what he called ‘the Middlebrow Muse’. These reviews were followed up with the same message when he was given the chapter ‘Poetry Today’ to write for the distinctly Leavisite Pelican Guide to English Literature, Volume 7, edited by Boris Ford. Musing upon the king my brother’s wreck. As a student at Cambridge Tomlinson had not been happy until, I think in his second year, Donald Davie became his tutor. Davie, who can’t have been many years older than his charge, was also a poet, alert to what was happening in the American poetry scene, a critic as readable as Kenner but less eccentric, and interested especially in the syntax of poetry which he characterized as ‘articulate energy’. He and Tomlinson formed a bond that lasted a lifetime. After graduating, and teaching unhappily in a school in Camden Town, Tomlinson scored a post as private secretary to the British writer Percy Lubbock, then living in Italy, in Lerici; but he was dismissed after three weeks, probably, he thought, because his genteel employer found his flat Midlands ‘a’ vowel unacceptable. Lubbock, he said, believed even ‘ants’ should be pronounced ‘aunts’ – but he allowed Charles and his wife Brenda to stay on there in a villino adjoining the gardener’s cottage, thus giving the Tomlinson sensibility an Italian airing from which it never looked back. It was a region the couple were to return to often. Tomlinson was seven years my senior and, though only a junior lecturer, was my senior also in status. We were amiably aware of one another without being close, and met regularly in graduate seminars, presided over by Knights and attended by most of the English Department staff. In 1958 he and Brenda had just moved to a rural location with the wonderfully English address of Brook Cottage, Ozleworth Bottom, Wotton-under-Edge. There was no phone, and never would be one. If a phone-call was necessary they climbed the hill to a pay-phone. Charles and Brenda had met while in their teens and were still married at his death 70 years later. The cottage was to remain their home. They would travel a great deal, but always come back to it. Their two daughters grew up there. Charles was also admired as a painter but I don’t recall that I ever saw any of his work. Many years later, at a conference in Tubingen on poetry and regionalism, he and I would reminisce warmly about the L.C. Knights days in Bristol. By that time, I noticed, the Midlands accent was pretty-much gone, replaced (though perhaps not with absolute security) by what used to be called R.P. – received pronunciation – meaning ‘correct’. Knights had long since moved back to Cambridge, to the King Edward VII Chair, where F.R. Leavis, his old colleague and more famous contributor to the critical journal Scrutiny, who would probably have liked that eminent seat for himself, referred to him as ‘Professor Judas’. This Regius chair should have been the ultimate academic triumph for Knights but when I visited him there, and he walked me in Queen’s College gardens, and took me to lunch in the College, it was soon apparent he was not altogether happy. To Frank Kermode, who would succeed him there, he reported his dissatisfactions and remarked, ‘Oh for the road not taken!’. I have no idea what this alternative road might have been. Tomlinson stayed on in the Bristol Department his whole working life, in the end I think occupying the Winterstoke professorship, the one Knights had held in the 1950s. But in 1957 I was (perhaps without good reason, certainly without careful consideration) put off his poetry partly just by his manner in person, a look of depleted energy, in fact of such profound, unrelenting weariness, I felt if it was not an illness it had to be an affectation; and by something in the lines themselves – a kind of disengagement, as if the words had been chosen with immense care, but with a faint feeling of distaste. The extract ends there. I wish I could say the effect of Tomlinson’s death has been to make me recognize my error, but I have looked again at some of his poetry and find there’s a difference of temperament so absolute that my mind begins to shut off when I read him. Two critics I greatly admire, American Hugh Kenner and British Donald Davie, have told me I am wrong about Tomlinson. But where Davie finds in his work ‘an exquisitely accurate register of sense impressions’, I run up against what seems to me a wall of abstraction and effete discourse. These are the critical conversations poetry constantly requires those of us who are serious about it to have – and there are no right answers, no final resolutions. Which does not present itself. 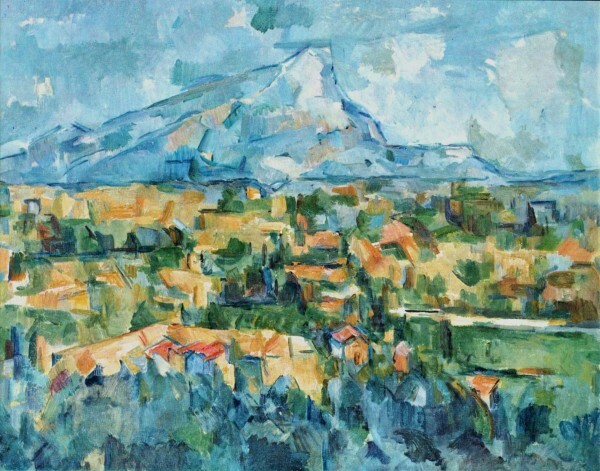 Mont Sainte-Victoire by Paul Cézanne, via Wikimedia Commons.